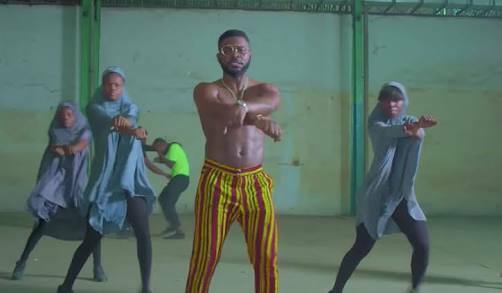 Muslim Rights Concern Group, MURIC has reacted to the ban on Falz's video, "This is Nigeria" video by the Nigerian Broadcasting Corporation(NBC). In a press release issued on Monday, the Islamic group commended NBC for banning the video and stressed that NBC should ensure that the video remained banned until the artist removes all the offensive parts. The group explained that the banning of Falz video may not be unconnected with a petition it sent to the National Film And Video Censors Board (NFVCB). The petition which was sent by courier to both the Abuja and Lagos offices of the agency was dated 11th June, 2018. “The video portrayed Fulanis and Muslims as killers. It also showed women in hijab engaging in the notorious ‘Shaku Shaku’ dance. Although reactions to similar provocative works of art had been violent in the past, MURIC as an elite Islamic group decided to adopt dialogue. We asked Falz to withdraw the video or we would sue him. Instead of showing remorse he dared us. We knew he could delay the court case for years because he is a lawyer and he would use every trick in the books to frustrate us. That was why he was boasting. “Therefore, instead of going to court, we decided to ambush him by sending a petition to the video board. This week, the NBC banned the video and others like it. He should be the one to go to court now if he likes. Let him go and show how brilliant he is in court. He and his fans laughed at us when we complained about his provocative and vulgar video. But there is no doubt that he who laughs last laughs best”. The leader of the human rights organization, Ishaq Akintola , who signed the press statement added, “It is hoped that Nigerian artists will borrow a leaf from this episode. We Muslims have been the laughing stock of Nigerian artists for some time now. They associate every dirty job with a Muslim name. It is no longer going to be business as usual. That does not mean that we hate artists. No, we don’t. Artists are creative and hardworking people. We appreciate creativity and hardwork. “We also love works of art and we respect artists who come out with brilliant ideas. We recognize the right of every artist to produce. But the right of an artist to produce whatever he likes stops where the rights of other citizens begin. Like all other citizens, we Muslims have the right to the dignity of our persons. Nobody can take that right from us. Our right is our right. The law is very clear about that. Fela Anikulapo Kuti used his songs to fight military dictatorship and other ills in the Nigerian society. But he never attacked Muslims or Christians. Neither did he incite Nigerians against any ethnic group. He criticized religious groups but never in a vulgar manner and he never exposed Muslims or Christians to ridicule”. MURIC related the incident to the phenomenon of terrorism and religious violence. “It is incidents like this which lead to religious crisis. Fortunately we handled it intellectually. Other people could have allowed it to escalate into a major religious crisis and turned it into another opportunity to kill, maim and destroy properties. It is rather unfortunate that Nigerians are yet to appreciate what MURIC has been doing in this regard. “It is germane at this juncture to analyse the anatomy of terrorism and religious violence. The cassu belli of most terrorist acts and religious violence is open or perceived injustice, including inadvertent or deliberate provocation. There is no smoke without fire and a good fire-fighter will point his hose at the fire, not at the smoke. “Injustice and provocation are the gays of terrorism. The latter is mere smoke and an ordinary symptom, not the real disease. The world has been running after terrorists all this while without addressing the root cause. It is a wild goose chase. Whoever wishes to genuinely address terrorism must uproot injustice and provocation. It is high time we stopped trying to extinguish smoke instead of putting off the real fire. “We want Nigerians to know that MURIC is inculcating a new culture of dialogue and informed response as the only civilised alternatives to spontaneous violence. We engaged Falz in dialogue instead of inciting young Muslims to start violent demonstrations. When he proved difficult, we extended the dialogue circle to the appropriate government agency. Muslims would have been called all sorts of names if we had started demonstrating or if we had been violent on the issue of Falz’ vulgar video. The image of Islam would also have been tarnished. But MURIC decided to be faithful to its avowed motto which is 'Dialogue, not Violence'. “We appeal to Nigerians to always follow this laudable method. Let us all abide by this motto at all times: 'Dialogue, not Violence'. Let us say goodbye to religious violence. We can get justice if we engage in dialogue and follow due process. We can still get our rights without shedding blood. Grievance is a square peg but violence is a round hole. There can never be synergy between the two. What you seek is not what you get and most of those who may die or sustain injuries are innocent passersby, vulnerable children and women. We therefore urge Nigerians and others around the world to join our quiet and peaceful revolution”. MURIC had some words of advice for Nigerian artists. “We charge artists, writers, journalists, publishers, etc, to be mindful of the sensitivities of other citizens. They should always follow due process. Films, videos and audio tapes should be submitted to the relevant agencies for clearance before public airing. “Before we round off, we extend a hand of friendship to Falz the Bad Guy. We are not enemies. Falz is a hardworking young Nigerian and our intention is not to destroy his work but his latest production, ‘This is Nigeria’should remain banned until the provocative and vulgar scenes are removed. The video can still go on air with slight modifications. “We advise Falz to retouch some areas. The Fulanis should not be portrayed as killers. The Chibok girls who are currently in captivity ought to be in sober mood instead of partaking in the drug-related ‘Shaku Shaku’ dance. Kidnapped individuals cannot be dancing recklessly. The phrase “everybody be criminal” used in the audio is false, baseless and highly misleading. It is also capable of damaging the image of this country. “Not every Nigerian is a criminal. As we have the Evans, so do we have the Oloyedes, the Ahmadu Alis, the Femi Falanas and the Sowores. Even Falz himself is not a criminal. Therefore Falz and other artists should encourage the youth to emulate our heroes instead of pushing them to ape rogues. Finally, we commend NBC and the video censors board for acting swiftly.